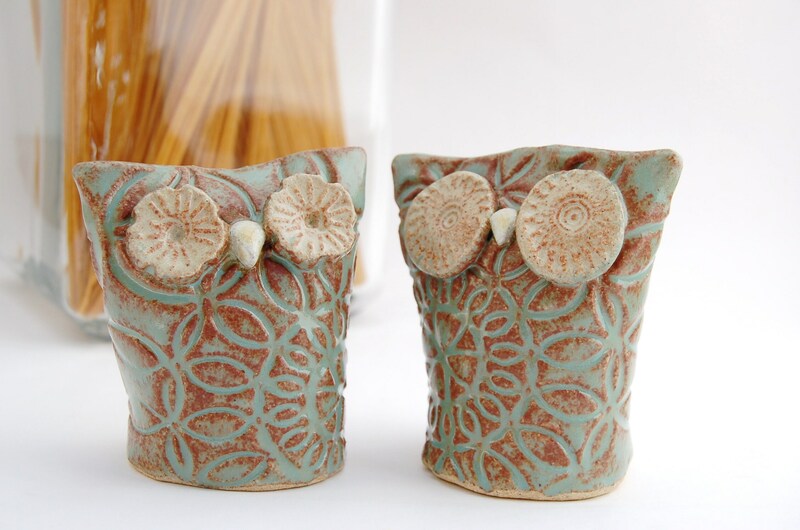 Owl Salt and Pepper Shakers - Hand Built Ceramic Owl Pair - Whimsical Soft Greenish Blue Kitchen Decor - Owl Sculpture Table Ware "Kismet"
Kismet are a whimsical pair of hand sculpted salt and pepper shakers with beautifully textured features, glazed in two different shino type glazes with rusty red breaks among soft greenish blue and beige hues. Their facial and body features were created using vintage buttons, vintage plastic doilies and a silicone candy mold. One of the set has two holes at the top of its head for seasoning dispersal, whereas the other has three located at the top of its head. You get to decide who fills up with whatever you wish! The pair are similar in size and shape, and they are unified in stylization and tone. Kismet measures about 3 inches wide from ear point to ear point, 3.5 inches tall and about 2 inches in depth. This set is intended for fine, ground, dry spices only. Hand wash and allow to dry thoroughly and completely before filling. 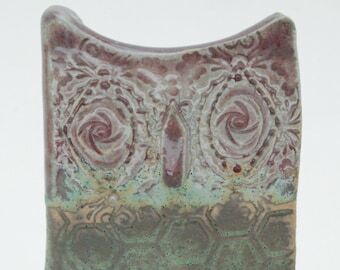 This set was vitrified to cone 6 temperature in an electric kiln. Rubber stoppers at bottoms are included, having a very snug fit. This set of shakers would make a lovely wedding gift for a beloved couple or fly them home to yourself for added flair at your table. Owl Salt and Pepper Shaker Set - Hand Built Ceramic Owl Pair - Whimsical Neutral Kitchen Decor - Owl Sculpture Table Ware "Sonny & Cher"
Ceramic Owl Kitchen Utensil Holder - Hand Built Raptor Open Top Container - Kitchen Pottery Vessel Vase - White Owl Home Decor - "Cucinare"
Ceramic Rustic Owl Sculpture - Earthy Woodland Pottery Raptor Figure - Free Standing Fine Art Owl Figurine - Yellow Orange Brown "Petra"
Ceramic Owl Wall Hanging - Owl Wall Art - Ceramic Owl Wall Tile - SECOND - Discounted Fine Art - Ceramic Owl Home and Office Decor- "Logan"